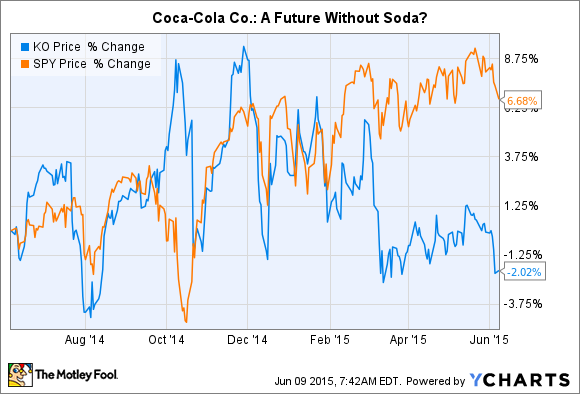 Is Coca-Cola Stock a Buy? Beverage giant has lost its pop, but it there's still the chance it could bubble up again. Coca-Cola's not about to go into the red anytime soon, but the beverage giant is still facing a number of hurdles. Even though it lost the top spot several years ago, brand consultancy Interbrand says Coca-Cola (NYSE:KO) still remains one of the world's most valuable brands. It held the No. 1 position of the best global brand for over a decade, but now ranks third behind Apple and Google. Even so Coca-Cola is still a powerhouse to contend with. The question for investors, however, is whether it can still translate that brand awareness and reach into its previous record of growth. In short, is Coca-Cola a brand on the rise or one in decline? Like fast-food leader McDonald's, changing consumer tastes that increasingly favor healthier, more natural foods and ingredients has created headaches for Coca-Cola. North America is its largest market, accounting for nearly half its revenues (but just 22% of its operating profits), yet it struggles to define a cohesive strategy to grow beverage volumes. Coke's first quarter revenues for the segment rose 6%, but only because there were six extra selling days in the period, the Easter holiday moved into the quarter, and it hiked prices. Volumes were flat year over year, and when it came to its sparkling beverages, they actually declined 1%. It was only because still beverages volumes rose 2% that it was able to tread water. Globally it was a little better, with both sparkling and still beverage volumes rising 1%, but in comparison to the more robust U.S. economy, its foreign markets are weak. And despite the gains it made, including in market share, the company stresses 2015 will be a "year of transition" and further improvement will only be incremental. Coca-Cola's uninspired performance has investors questioning exactly what they're paying the management team to do. It's in the midst of a multiyear $3 billion cost-cutting program, but the board of directors saw fit to lavish CEO Muhtar Kent with an extraordinarily generous pay and benefits package that effectively gave him a 24% raise last year. Investment house Wintergreen Advisors led a mini revolt against Kent's pay last year, which supposedly caused the board to rethink how it compensated management, but whether continued negative sentiment about its practices leads to further changes remains to be seen. Muhtar Kent has been a fairly effective steward of Coca-Cola, but as it cut costs, fires employees, and otherwise tightens its belt, the optics of a gold-plated executive pay package strikes many as ill advised. Yet Coca-Cola will ultimately prove its mettle by how well it's able to satisfy those changing consumer preferences. It has several initiatives in place to do so, but it remains to be seen whether any gain traction. In soda, for example, Coke launched Coca-Cola Life with stevia as a more natural sweetener to replace aspartame and high-fructose corn syrup. It also took a large stake in at-home coffee giant Keurig Green Mountain (UNKNOWN:GMCR.DL) as it sets its sights on the DIY cold beverage market. Rival PepsiCo (NASDAQ:PEP) is similarly eying the space with a limited trial partnership with SodaStream International (NASDAQ:SODA). More recently it launched a new line of so-called "craft sodas." But they're both fighting an uphill battle with industry watchers Beverage Digest saying U.S. per-capita consumption of carbonated soft drinks fell last year to its lowest level since 1986. In contrast, the International Bottled Water Association says bottled water consumption grew to 34 gallons per person in the U.S. last year, a 7% increase over 2013, and there's the possibility water consumption could surpass soda as soon as 2017. In still beverages, Coca-Cola introduced a premium milk product called Fairlife as a bet on the protein-infused food and drinks trend, but it's hard to imagine consumers forking over more money for something they're also drinking less of. Milk consumption has been on a longer downward trajectory than even diet soda. As much as this highlights the battles Coke faces, don't count the beverage giant out yet. There's a reason it's the third most valuable brand in the world, and in large part it has to do with its portfolio of 20 brands that generate in excess of $1 billion a year each. It has another 16 brands that could make it to the big leagues as well. Most of those brands are still beverages, mostly teas and water, so it's clear Coca-Cola understands well the changing tastes of the consumer and has proved willing to meet the challenge head on. Financially Coke is sound and over the past 12 months produced more than $8.6 billion in free cash flow, 8% more than in 2013 and almost 20% more than five years ago. But trading at 19 times next year's estimated earnings and with its enterprise value going for more than 23 times its free cash flow, Coca-Cola stock isn't cheap. It's a solid company, but investors might just do better waiting for its valuation to go a little more flat before pouring Coca-Cola's stock into their portfolios.